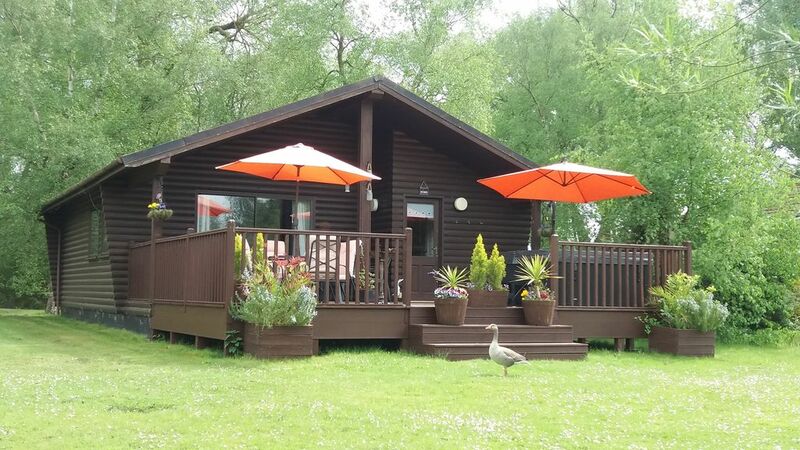 Bunting Lodge, located on the picturesque, Duck Lake, Tattershall Lakes Country Park, Lincolnshire. Bunting Lodge is a detached wooden cabin, sleeping six people in two bedrooms which are made up of one double and one twin bedroom respectively, double sofa bed in lounge. Bathroom with large shower and toilet, another separate toilet. Open plan living area and modern kitchen, dining area and sitting area with newly laid laminate flooring. New six berth hot tub installed on large decking area overlooking the picturesque fishing lake along with newly erected private fishing peg directly outside the lodge. Three well stocked fishing lakes of which Bunting Lodge overlooks Duck Lake. Ideal for fishing or enjoy the luxury of bathing in the hot tub. Off road parking for 3 vehicles. Tattershall Park facilities include water skiing, wakeboarding, jet skiing, golf, coarse fishing, indoor heated swimming pool, outside cinema, gym and spa. There is an on-site shop and bar/restaurant. Note: You will require passes enabling you to access some of the facilities onsite. These are obtained directly from reception for between 3 days to 7 days. The park is right next door to Tattershall Castle and the Battle of Britain Memorial Flight in Coningsby. Being close to the RAF base means at times there can be Aircraft flying over. My wife and I have stayed at Tattershall Park with friends many times and always enjoyed ourselves. We are lucky enough now to own a lodge, a new adventure for us. We hope you enjoy staying at Tattershall Lake Country Park as much as we did and still do! Duck Lake is a quieter part of the park but at the same time, close to all the amenities. Nearest beach is Skegness about 40 minutes away. Tattershall has a local Coop as has the next village Connington. Newly built private fishing peg directly outside the lodge. We had a fabulous stay. The lodge was very clean and comfortable. We loved the hot tub and there was a fantastic selection of cd movies we could watch after dark. The boys loved the aqua park and tried many new activities. Amazing holiday can’t wait to go back. This is a perfectly placed lodge.. huge hot tub and only a 5 min walk from the entertainment facilities..
It’s nice to wake up with ducks on ur decking!! Ideal if you fish.. (unfortunately I don’t) but the family loved the break.. Wide range of dvds, card games etc and the beds are very comfortable.. Bottle of fizz upon arrival was a nice touch..
We rode the bikes to a big go kart track about a ten min ride which my twin boys loved!! We will definitely be staying there again..
Views over looking the pond was incredible, The hot tub topped it all soo relaxing. Definately come back again highly recommend to anyone. Thankyou for the prosecco really made me smile 😊 loved every minute of our stay. On arrival we were really impressed with the location of the lodge. The lodge provided everything we needed for our stay, it is well looked after and cosey. The bottle of prosecco on arrival was a nice touch. It is only a short walk from the activities and the bar and restaurents. The hot tub was great and the kids loved just being in the hot tub whilst watching the wildlife right next to them. The hot tub lit up at night was fantastic and was a lovely way to end the days. The kids loved being out on the decking watching the RAF Typhoon jets and the Battle of Britain World War II planes they just found it so exciting and the lodge is in a good spot when they took off and came in to land. We thoroughly enjoyed our stay here at Bunting Lodge and the kids where entertained allowing us time to relax as well. Would definately stay again! The owners Marion and Danny have been a pleasure to deal with and have answered any questions we've had straight away regarding out booking. We have been overwhelmed with the responses to the lodge, and thank you too for your comments. So pleased you enjoyed yourselves. Bunting Lodge is set in a quieter, spacious area of the park overlooking one of the lakes. After walking round we thought the location was one of the best on the park and the neighbours are a decent distance away! The lodge itself is lovely and homely. It is well presented, beautifully furnished and contains some personal touches. The bedrooms are a good size with plenty of storage and the sofa bed isn’t obtrusive when in use. Two bathrooms makes life easier! The spacious outdoor decking area is great and even though the weather wasn’t the best we were still able to sit outside and admire the view under the sheltered canopy. The hot tub really made the holiday! We used it every night to relax and on a clear night the stars were amazing as it is such a rural spot. When we did have a light shower we put one of the parasols up and we could still enjoy the hot tub. I can’t comment on the resorts main facilities as we didn’t use them. The kids did go on the aqua park and thoroughly enjoyed it.